Rod Hatter is an experienced franchise law and small business attorney. He has been an attorney in private practice in Orange County, California since 1985. He has specialized in providing legal services to franchisors, franchise owners and other businesses of small to medium size. His legal skills and experience cover nearly all areas of business law, with an emphasis on franchising but including purchase and sale of business (“mergers and acquisitions”), securities, employment contracts and formation of corporations, partnerships, limited liability companies and other business entities. He is often called as an expert witness on franchise matters. Rod is committed to the practice of law and to the development of laws that foster productive interaction between businesses and state and federal governments. He has been appointed to the California State Bar Franchise Law Committee for four separate terms, with his most recent term ended in 2013. He recently headed the State Bar's approval of Franchises and Distribution as a board certified specialty. He served as Chair of the State Bar Franchise & Distribution Law Advisory Commission, which prepares the exams and approves candidates for this specialty. This means that the public can go to the State Bar website (calbar.ca.gov) and find a board certified specialist in this area who has been approved for experience and knowledge in this specialty. On a national level, Rod has been an active member of the American Bar Association Forum Committee on Franchising since 1979 and he joined the Legal-Legislative Committee of the International Franchise Association in 1977; he speaks about franchising and other distribution methods at various bar association meetings and to other groups and has a good working relationship representing his clients to the California Department of Business Oversight. His goal is always to minimize legal costs to clients, first by writing clear and simply stated documents which all parties understand and second by communicating effectively with client adversaries to keep all issues on track and avoid unnecessary confrontations. On the other hand, he has a reputation for taking tough stands and fighting for his clients. From 1978 through 1985, Rod was General Counsel for Taco Bell Corp., which is now California's largest and most successful franchisor, thanks in part to Rod's role in establishing its current franchise program in 1981. Taco Bell was then owned by PepsiCo, Inc., and Rod also acted as PepsiCo's West Coast Area Counsel, handling the legal needs of various other divisions and subsidiaries in this area. From 1976 through 1978, Rod was the Senior Associate Counsel for Pizza Hut, where he was responsible for its franchise program and franchisee issues, SEC and NYSE compliance, international franchising and various special projects, including the sale of Pizza Hut to PepsiCo, Inc. in 1977. He was initially trained as a young lawyer at the well known law firm of Dewey, Ballantine in New York City, where he specialized in securities laws and initial public offerings and worked with Presidential Candidate Tom Dewey. Having been raised in Kansas, he subsequently moved to Wichita, Kansas, where he became a partner in the Foulston Siefkin law firm, the largest firm in the state. One of his law firm clients, Pizza Hut, persuaded him to become its inside counsel and a corporate officer in 1976, not long before PepsiCo, Inc. purchased Pizza Hut. PepsiCo’s Law Department moved Rod and his family to Orange County, California, in 1978, and they settled in the Laguna Niguel area. Upon graduation from high school in a small Kansas town, Rod was selected to be one of five Alfred P. Sloan Scholars at Harvard University, the highest honor given to incoming Harvard freshmen. He graduated from Harvard in 1966 with honors. Rod then received a scholarship which allowed him to attend Columbia University School of Law in New York City. The focus of his studies was securities, and after he received his J.D. degree from Columbia Law School in 1969, Rod went to work immediately on Wall Street. After several years of intensive securities work, he left New York and returned to Kansas to begin his work with smaller businesses. Rod is married and has two adult sons from a prior marriage. He was until recently a co-owner with one of his sons who is engaged in a successful franchised business in the San Diego area. He is the proud grandfather of five grand children and hoping for more grandchildren. His passion beyond his family is motorcycle riding. Rod returned to this hobby in 1987 when he bought a limited edition Kawasaki Ninja, and he now owns a Harley Davidson Road King. He tries to ride each week end and makes several road trips each year. In between, he spends a lot of time polishing chrome. 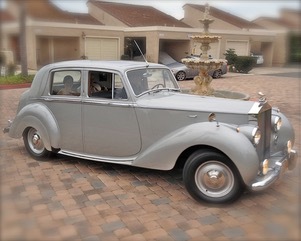 In 2006, Rod acquired even more to polish with the purchase of a rare 1949 Rolls-Royce Silver Dawn, which happens to be the 12th "complete" Rolls-Royce ever made and is in beautiful condition. It received a trophy for best in its class at the first car show Rod entered it in and has become fairly well known on Pacific Coast Highway in Laguna Beach. It is not a fancy motorcar but certainly has character. Rod has also been active in various charitable and service organizations. After the move to California, he and his sons became involved with the local YMCA, where Rod later became its Board Chair. He then became a member of the Orange County Metro Board of Directors and acted as Chairman of its Branch Development Committee. Rod was one of the founders of the World Kids Foundation, which was organized to assist children who live in less fortunate countries, and was a co-founder in 2006 of the Golden Angels Foundation, which raised funds for local charities and needy individuals in the Orange County area. One of his annual pleasures is interviewing local high school seniors who have applied to Harvard, young people with outstanding accomplishments already and great opportunities for the future. Pati received her Juris Doctorate from The University of Willamette School of Law. She graduated from the Virginia Tech, where she earned her degree in Political Science and was a member of the Virginia Tech Honor Court. Pati is a transactional lawyer who concentrates her practice on franchise and licensing law, commercial transactions and general corporate work. She has counseled and prepared franchise documentation for franchisors in a variety of industries. Pati's work in this area includes drafting domestic franchise disclosure documents, franchise agreements, area development agreements, multi-unit development agreements, licensing agreements and similar documents. She has extensive experience assisting clients with state franchise registrations and counseling clients on federal and state franchise law compliance. Pati is currently a member of several franchise industry groups including ABA Forum on Franchising. She is a member of the California State Bar Franchise Law Committee and serves a Vice Chair of one of its committees. She was admitted to practice law in the state of California in 1991. Pati's past experience includes 5 years working for Adobe Systems, Inc. as a marketing manager, where she created marketing programs and demand generation initiatives for product seminars, field marketing events, trade shows and eSeminars.